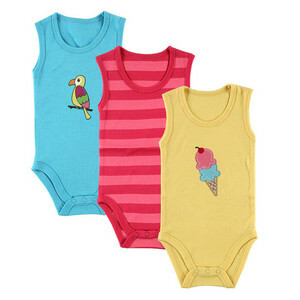 Hudson Baby Girl Hanging Bodysuits 3-Pack are a stylish way to dress your precious little one. 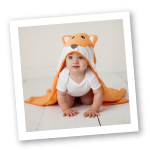 Made of 100% cotton, these bodysuits are soft to the touch on your baby’s skin, but durable and machine washable for everyday wear! The sleeveless design is great for keeping baby comfortable during the warm weather, or used as a undershirt in the cooler months. Adorable printed designs will have you wishing it was always summertime! These are great! Quality is excellent, and the price is unbeatable. The cotton isn't thin but that's good because it means it will survive all the washing and scrubbing off stains that baby clothes have to go through. The sizes are a little big but not bad. I got the size according to my baby's age and she will probably fit then a few months past the size range.